A musical meditation on Advent & Christmas recorded live in concert at the Church of the Blessed Sacrament, New York City. The Ignatian Schola is a Manhattan-based vocal ensemble composed of Jesuits and lay colleagues. Rooted in Ignatian spirituality, the schola performs an eclectic repertoire of sacred music that includes chant, Renaissance motets, and music by contemporary composers. 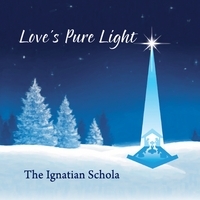 "Love's Pure Light" was recorded in concert at the Church of the Blessed Sacrament, New York City.